Streamfully — General Cybernetics, Inc. 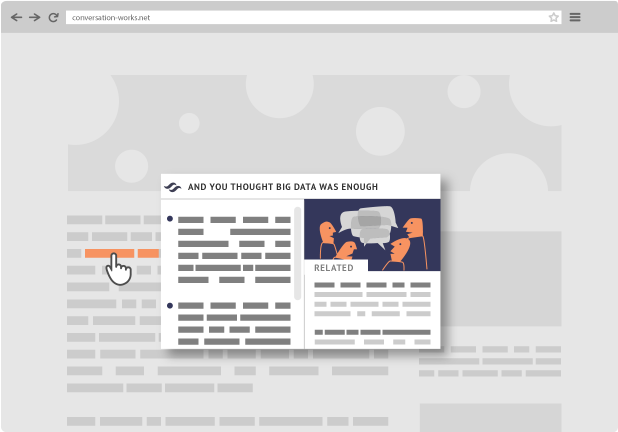 Roll over a hyperlink and Streamfully brings you novel & personalized content, down to every snippet. Save time & effort — Look before you Link. When you roll over a link, Streamfully understands that page the way you would — based on your prior reading & current context. It automatically selects snippets just for you & streams them from one idea to the next. Streamfully builds a relationship with you and is never repetitive or awkwardly unfamiliar. It's always fresh and engaging, down to every connected idea, like a good conversation. How do I use Streamfully? Roll your mouse over a hyperlink and pause. Streamfully will run automatically and bring you a stream of information that is personalized down to the snippet. It learns from your browsing to streams focus, relevant content while avoiding repetition. What does Streamfully show me? On the left side, Streamfully shows you relevant snippets from the page you rolled over. On the right side are a related image and personalized, highly relevant snippets it selects from the site you’re currently on, or from across the web — roll over these to see a related image, and click to go to that page. How does Streamfully decide what to show me? If this is a new topic for you, Streamfully shows you the page’s important content starting from the top. If you have touched this topic elsewhere, Streamfully shows you something new but connected to what you’ve been interested in before — just like a conversation. 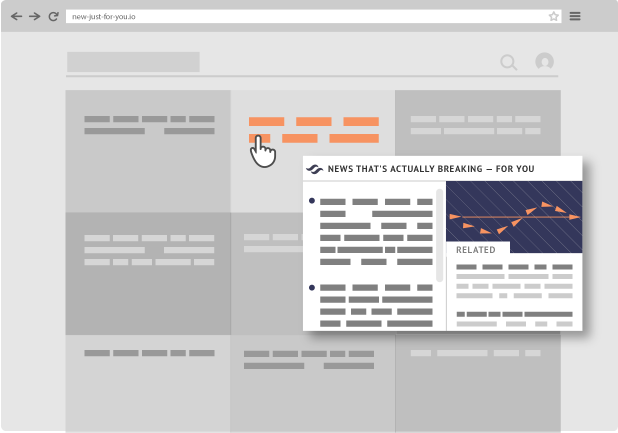 Streamfully is a new generation of discovery engine because it creates a “conversation with content” that personalizes down to the snippet. What controls does Streamfully give me? Select a snippet on the left side to read further into the page you rolled over. Select the title to go to the page itself. Select a snippet on the right side to move to a new and highly related page. What are the best links for Streamfully? The current version of Streamfully excels on links to pages that have article-length text. We are continuously improving Streamfully and welcome your suggestions for sites and links you’d like. Why does Streamfully sometimes show me the top part of a page instead of snippets selected within a page? If you have no personal history on a topic, Streamfully will show the top part of the article to get you started. Once some history has been established, Streamfully will show personalized snippets. How can I repeat what I've already seen from a link? On the right of the Streamfully title bar is an icon for Settings. Click that and choose 'Reset "read" history'. What data does Streamfully collect? When Streamfully is on, it records the websites you visit and links you roll-over so that it can personalize its results to you. When Streamfully is off or disabled on your Chome extensions page, it does not record any data. See our Terms of Service page for a detailed description. How do I turn Streamfully off? The Streamfully icon is displayed to the right of the browser URL bar, along with other icons for Chrome extensions you have installed. Click Streamfully's icon to turn it on and off. When Streamfully is off (icon is grey), it will not attempt to “look ahead” into links until you click on its icon again. You can also toggle Streamfully on and off via its "hot key", command-shift-= (command + shift + equal-sign). Can I run Streamfully on my current browser page, instead of a link on that page? Yes: move your cursor to a blank part of the browser page and control-right-click. The context menu will show an option to "Look ahead with Streamfully". Click on that. The Streamfully results will be for your current browser page. Can I run Streamfully on my phone or tablet? Not from the Chrome Extension, because browser extensions are not allowed on mobile devices. But we have a simple, one-line script that publishers can embed in their site to achieve the full features of Streamfully. Please contact us and we’ll ask the publisher directly. Just email us at feedback@generalcybernetics.net with your thoughts, suggestions and partnership ideas. Streamfully is brought to you by General Cybernetics, Inc., a New York City startup with deep experience in the cybernetics of conversation and product design.